On behalf of the children, parents, staff and governors, welcome to Godolphin Infant School's new and (I think you'll agree,) very much improved website! It is a humbling honour to serve this welcoming and supportive community as Headteacher, as we drive this school forwards towards excellence. Godolphin Infant school is steeped in over eighty years of tradition, educating the young children of this vibrant, diverse neighbourhood that originally served the local trading estate in a range of manufacturing and engineering roles back in the 1930s and continues to in a multitude of different ways today. Since its conception, the school has seen many changes, becoming co-educational; expanding to what is now a four-form entry; converting to an Academy and then finally becoming part of Baylis Court Multi-Academy Trust. 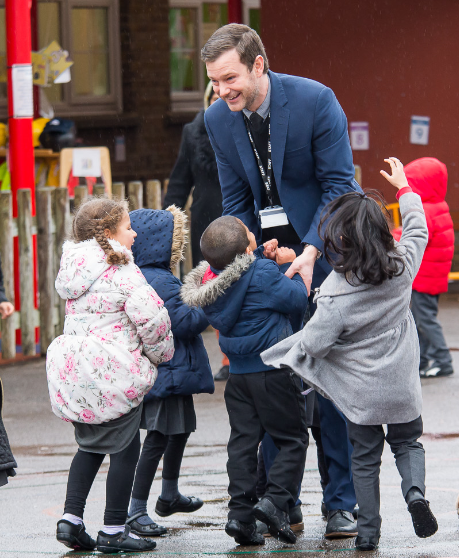 Since joining the school in September 2016 I have been impressed at the rigour of the staff here and how passionate and motivated everyone is to provide the children of Godolphin Infant School the education they deserve. We place a huge importance on developing the unique potential of every child, with their interests at the heart of our curriculum. Our curriculum is purposefully broad and based around experiences to engage and inspire our young learners. We want each and every child to be a Happy, Effective Learner, who is Responsible and Open-minded. Teamwork is pivotal in our HERO values, involving everyone -children, parents, staff, Governors and the wider community.